One of Gotham City’s top chefs tells us what’s he loving right now. Chef Alfred Portale is a culinary creator, innovator and architect whose heart belongs to the very restaurant where his career began 26 years ago—Gotham Bar and Grill. Portale, executive chef and co-owner, wanted to create a restaurant that emulated the standards of the three-star Michelin restaurants from his time in France with Jacques Maximin and Pierre Troisgros. Portale’s dedication to sourcing quality ingredients from small farms and specialty purveyors placed him among those chefs who are identified as the leaders of the movement known as New American Cuisine. Within three months, Gotham received its first three-star New York Times review, and Portale’s reputation was established. 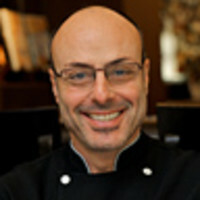 Today, he has earned a total of five three-star reviews from The New York Times; the James Beard Foundation Award for Outstanding Restaurant in 2002; and the James Beard Foundation Award for Outstanding Chef in 2006. This seasonal salad recipe is wonderfully easy and refreshingly perfect for those fleeting summer nights. Directions:To make the dressing, combine in a small bowl the mustard, vinegar, oil, salt, and pepper. Stir to combine. Set aside. Halve the plums, cut into thick slices place in small bowl. Drizzle with dressing and season with salt and pepper. Set aside. In large salad bowl, combine greens, scallion, and radish; dress with remaining vinaigrette and season with salt and pepper, toss. On a large platter arrange the plums and greens, sprinkle with pistachios, then crumbled cheese. Optional: Substitute a little truffle oil in the dressing and shave summer truffles over top. Substitute peach, apricots or even strawberry for the pistachios. Regular almonds or Marcona almonds also work well. This homey and homegrown spot on the East Coast has a table and a delicious meal with your name on it. The Woodland has been around for close to 20 years and is the most popular restaurant in the Lakeville, Conn. area. Chef/Owner Robert Peters not only manages the kitchen, but also presides over an outstanding wine program. He sources in-season produce from local farms and even has someone drive in fresh seafood from Portland, Maine. Not to miss: any of his salads and the steak au poivre with absolutely killer French fries. Hotdogs and hamburgers need not apply—this read takes BBQ to the next level of grill power. Serious Barbecue by Adam Perry Lang. This is one of the most comprehensive books on the subject. Even as a professional, I found a lot of useful information and some cool tricks and techniques. The book is beautifully photographed–the photos are really inspiring. Although some of the recipes can be a bit labor intensive, they provide superb results. In case you need another reason to visit sunny California, this city’s culinary scene will not leave you disappointed. San Francisco. One thing I love to do is go to the Ferry Building on a Saturday morning. It boasts one of the most beautiful farmers’ markets, extraordinary food and great people watching. After strolling, you can sit outside and eat oysters at Hog Island Oyster Company. Other places not to miss include Tartine for breakfast, Zuni Café for lunch, A16 and Delfina for dinner. The Slanted Door’s also an excellent place for lunch or dinner. I also love strolling around Chinatown to shop for things like ceramics.